The classic combination of white chocolate and caramel will warm you up on a chilly winters night. Each 2 lb. bag of White Chocolate Caramel Cappuccino Mix makes about 22 - 8 oz. servings. INGREDIENTS: SUGAR, NON DAIRY CREAMER (CORN SYRUP SOLIDS, PALM OIL, MONO-AND DIGLYCERIDES, DIPOTASSIUM PHOSPHATE, SODIUM CASEINATE (A MILK DERIVATIVE), CONTAINS LESS THAN 2% OF SILICON DIOXIDE, ARTIFICIAL COLORS, SODIUM STEROYL LACTYLATE, NATURAL AND ARTIFICIAL FLAVORS. 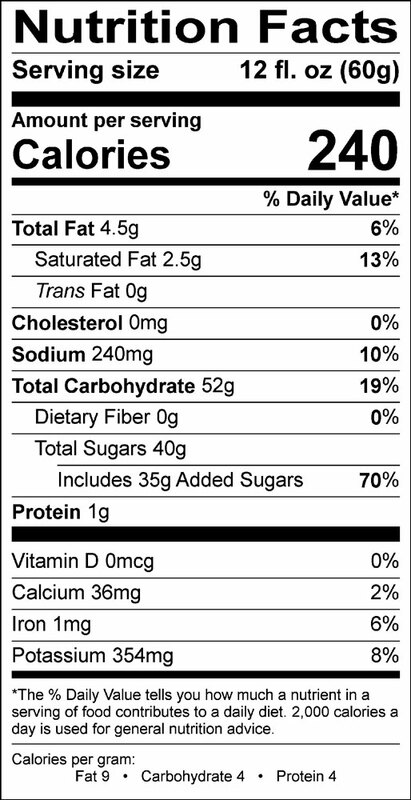 ), WHEY, CORN SYRUP SOLIDS, CONTAINS LESS THAN 2% OF ARTIFICIAL FLAVOR, CELLULOSE GUM, COCOA PROCESSED WITH ALKALI, INSTANT COFFEE, NATURAL AND ARTIFICIAL FLAVOR, SALT, SILICON DIOXIDE, XANTHAN GUM. I'm drinking some right now. It's like liquid comfort food. So rich and creamy smooth with an excellent taste. I highly recommend it! Smooth taste and great price! I Love the Sweet Taste of this and I use it as a Coffee Creamer also. Our Customers at our Meat Market love the White Chocolate Caramel. It's our best seller. I.m so glad to find this. It really helps to have a choice in flavors. Quick view Sold Out - We Are Making More!